The Big Point: Its not about limiting box size, its about putting your smaller retailers in the right place. The truth is, there are already many great sources for how to effectively arrange retail in a walkable format. A few weeks back I did a post considering regional retail where I pointed to a number of great books on the subject. As it relates to this series, I will get to my primary thesis: Smaller retailers can thrive in both a mega-regional, car-focused retail center just as they can in a walkable, mixed-use town center environment. But if you’re putting the majority of your region’s capacity for smaller retailers into car-focused, single-use mega-centers alongside the big boxes, then they aren’t going to go into your walkable town center. So, it is not a question of punishing your big boxes, rather it is about directing your smaller shops to a more effective place. Local and regional stores alike are mixed into this car-focused shopping center. First lets consider the mega retail center…what’s the real advantage of having your small shops there anyway? Chances are, anyone hitting the big box will likely get back into their car in order to go across the lot to the burger joint anyway and more likely will just head home. Meanwhile, someone visiting the smaller shops by the box are not likely to stroll up the arcade, window shopping to see whats for sale (again, a lesson from the mall: window shoppers want a circuit to walk. They will easily opt out of a shopping stroll in a linear strip mall setting if they have to walk back in front of the same shops they just walked by). More likely, these shoppers are targeting a single shop, looking for the closest possible parking space, and then leaving when their chore is done… knowing they can go to the cozy mall if they want to “shop.” For any value achieved by directing a regional market to a critical mass of retail in a car-focused shopping district, the only clear winner is the developer who gets the windfall of commercial zoning while the municipality is saddled with expensive, car-focused infrastructure that can’t be sustained into the future, shoppers who must bear traffic and unsightly parking lots, and neighbors who miss out on a valuable destination and lifestyles options provided by mixed-use. While a mixed-use town center is never easier for a developer or even the approving authority, it is a better balance of stakeholder desires. But let’s back up. If your town’s vision is already looking for walkability, mixed-use, transit-oriented development, main streets, sustainability, or any other number of loaded buzz words, then we are past rationalization.. it is your duty to implement that vision by directing your retail to a walkable, mixed-use place, and supporting it by not diluting the market by also putting those shops down the street in the mega-center too. Fortunately, it doesn’t have to be painful. When market demand supports your retail, the developers can still make money while the municipality gets a dynamic urban environment that can change over time, supporting multiple transportation choices (including the car) while still getting a healthy tax base (with less expensive infrastructure), and the neighbours get a real place to shop, recreate, reside, work, and just enjoy their human existence. Belmar, a greyfield mall redevelopment in Denver, effectively mixes both local and national/regional shops in a walkable, mixed-use environment. The Shops: When I talk shops, I mean small retailers from 100 sf to maybe 8,000 sf, which includes most modest restaurants, banks, and most of those stores you find in between the department stores in the mall. For the most part, these should always be located in a mixed-use, walkable format regardless of their regional-versus-neighborhood market and whether they are mom and pops or national retailers. Small to Medium-Sized Neighborhood Retailers: These include your 15,000 sf drug stores up to a 40,000 sf grocery store which are scaled to a neighborhood market rather than a regional market. Again, these should be embedded within a mixed-use, walkable town center although there are many ways to arrange the store to maintain front parking. Medium-Sized Regional Retailers such as furniture, office supplies, electronics, and craft stores also end up in that roughly 15,000 – 50,000 sf scale. Here is where you may allow some of these smaller regional retailers to cozy up next to the big boxes. But they also bring value to a regionally-focused, mixed-use center so be careful you don’t let these go if you need them. Large Format Retailers: These are generally regionally focused in their market at sizes ranging from roughly 50,000 sf to 200,000 sf and are synonymous with “warehouse” retailers. And where do freestanding warehouses go? Industrial districts. So, unless they are rearranged in a form other than a freestanding warehouse, put them alone in their own district. Mega Retailers: Regional retailers at over 200,000sf are the big boys and they are hard to rearrange in form and hard to repurpose when they are vacant. Again, give them their own district. 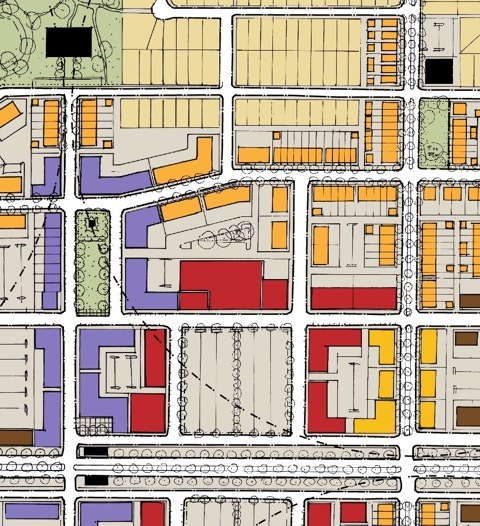 This study demonstrates how you might focus your main street, mixed-use commercial (in purple) on a walkable street while effectively integrating a grocery store and other shops in a walkable setting (in red). 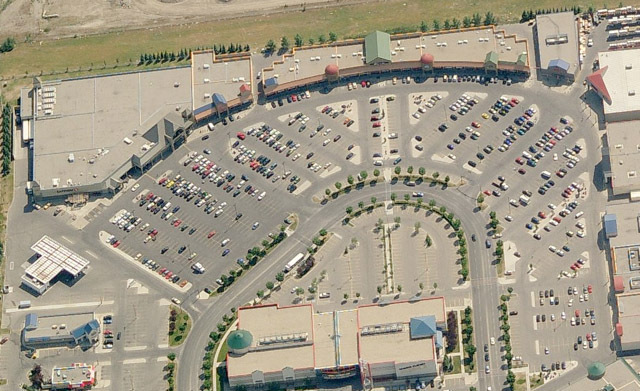 Least Desirable – The Mega Center: If your aim is to create more walkable, mixed-use places, then don’t let your smaller retail energy go to the mega center. The mega center takes it all: from the small shops up to the mega retailers, from neighborhood retailers to the regional market. All car-focused and disconnected from surrounding land uses, both local neighbors and interstate passerbys enter through the ring arterial to a parking lot nirvana. These places are outdated and really unjustifiable in the current scheme of things. Better – The Full Split: Put the large and mega formats together in their own industrial, highway ramp accessed district. You may consider some medium-scaled regional retailers and limited food and beverage places, but keep the shops in a walkable town center and whatever you do, don’t saddle the neighbors with their daily shopping needs in a regional big box environment. Better – Town Center Adjacency: There is some value in putting all your regional retail together. One possibility is to create a mixed-use, walkable town center integrating most of your retailers and connected to a neighborhood on one side, and then allowing your warehouse retails to exist in their own environment adjacent to your center. This is a case where you should lay out the warehouses and their parking in a grid to accommodate future repurposing. Better – Town Center Integration: Although easier to do from scratch, and relatively parking garage intensive (i.e. 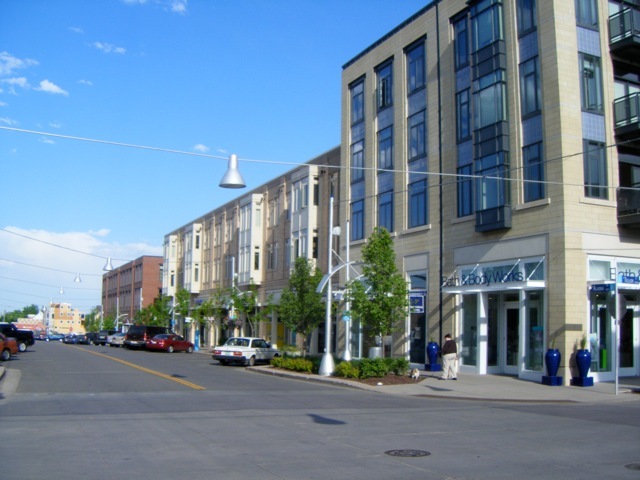 expensive), there are many examples (and many more techniques) of how to integrate your larger format retailers directly into a walkable, mixed-use town center. If you can do it, great… it makes for a dynamic, busy urban place. But don’t die on that hill if you can’t. There are easier ways. 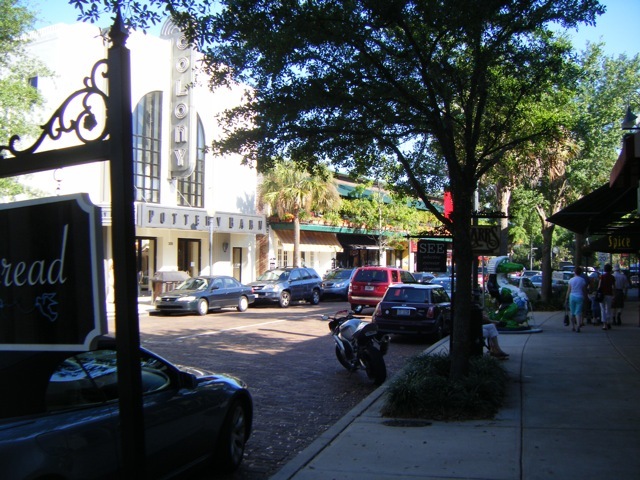 Winter Park, Florida has directed their local and regional retail to their existing downtown. In conclusion, as we enter a new economy and, arguably, increasingly austere times, the idea of creating brand new, mixed-use, walkable environments may seam questionable. The fact is that this development energy does currently exist (now under construction), and that there are still new shops being built in the wrong place is reason enough to justify this series. But your walkable, mixed-use town center does not have to be brand new. It may be your downtown that was robbed of its small shops long ago (and no, you can’t just blame the big box, there are plenty of small shops thriving next to the big boxes that could otherwise be in a different setting.) Looking at the big picture, the most desirable situation is to first direct your retail energy to existing downtowns, brownfields, and greyfields that need it most and already have infrastructure in place (and a built-in market down the street). But don’t let that blind you from doing what you need to at the city’s edge with new development, as it is all interconnected.